I returned from Kenya over a month ago and am still reflecting on the conversations that I had there with teachers, students, administrators, and officials at the Kenya Institute of Education. There's so much to think about and digest. The one thing, however, that I have been thinking about ever since I came back is the lack of reading culture in Kenyan schools. One of the main things that all English teachers we worked with wanted to learn from our workshops was how to encourage reading in their classrooms. You may think that this problem is not unique to Kenya, that in many classrooms in wealthy developed nations students are also often uninterested in reading. I agree. As an English teacher in Canada I often struggled with this challenge in my classroom. 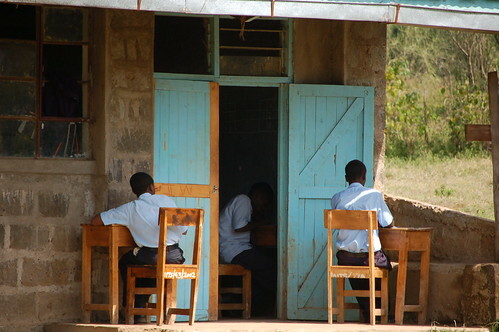 However, in Kenya, this problem is compounded by some deep-rooted issues that have been part of the education system since Kenya gained independence in 1963. First, almost all the students and teachers we came into contact with in the rural schools we visited speak English as their second or even third language. Yet, when teachers speak of encouraging a culture of reading, they invariably mean the culture of reading in English. In other words, they want to encourage a culture of reading in a language that students use very rarely outside the classroom. Second, the Kenyan system of education is dominated by exams which play a crucial role in deciding the students' future. Results obtained on these exams determine whether or not the student can move on to the next grade, to high school, or to post-secondary education. If the results are not high enough, the student is almost always left without options. Kiswahili and English are both taught in Kenyan schools. Kiswahili is the language of instruction in grades 1 through 3, while English is taught as a subject. In grade 4, English replaces Kiswahili as the language of instruction and Kiswahili is taught as a subject until grade 12. The language policy is bilingual, but from what we've observed some Kenyans are monolingual, some bilingual, and some multilingual. In other words, most of the children we observed and most of the teachers we worked with speak three languages: they speak their mother tongue (Kikuyu in the region we visited), Kiswahili, and also English. 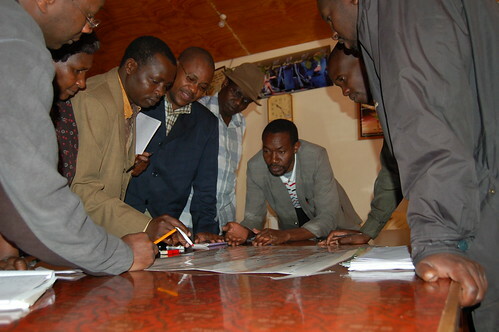 English is not the language you hear on the street in small towns and villages in rural Kenya. It is rarely used by the students outside of class time. What this means in the classroom is that the mother tongue or Kiswahili are used quite often. Occasionally, even the teacher uses the mother tongue or Kiswahili to explain challenging concepts (personal observation; Muthwii, 2004). Also, when students converse with each other, both in class and outside instructional times, they very rarely use English. I observed this phenomenon in every elementary and secondary school we visited. English is therefore seen in very pragmatic terms. It is used to obtain an education and write exams. As a result, students do not use colloquial English, and it could even be argued that in a country where English is often a third language, there are limited opportunities for them to do so. As Commeyras and Inyega argue, "their instruction in English typically lacks meaningful interactive use in meaningful contexts" (2007). English is not the language of social interaction. Code-switching is very common in instructional contexts. The use of Kiswahili or mother tongue among students outside of class is the norm. Voluntary reading in English is therefore rare because English is perceived as a tool used only to pass exams and secure employment (Commeyras & Inyega, 2007). This lack of interest in English is greatly exacerbated by the fact that, in Kenya, students write exams at the end of every grade. They must pass that final exam to proceed to the next grade. They also write a cumulative exam at the end of elementary school (grade 8). Known as the Kenya Certificate of Primary Education (KCPE), this exam determines whether or not the child will go on to secondary school and also the kind of secondary school he or she will attend. Then, at the end of high school, students write another exam, known as the Kenya Certificate of Secondary Education (KCSE). This exam determines whether or not the student can be considered for admission to a post-secondary institution. If a child fails either one of the exams, her educational opportunities end. She will not proceed to high school or post-secondary education. She cannot try again. Her entire life depends on two hours at the end of grade eight or grade twelve. Needless to say, reading and the use of English are associated with formal schooling. One uses the language to prepare for and pass exams. Reading and writing in English are perceived as skills that students need to develop to function successfully in school, not something that a student perceives as valuable (or even usable) outside the classroom in her community and in social contexts. Imagine trying to build a culture of reading in English in a classroom where the students see English only as a means to an end. It's a language they do not use in their daily lives outside of school. In fact, students in rural communities do not have many opportunities to practice the language in interactive and meaningful social contexts. This lack of what Commeyras and Inyega call "enabling environment" (2007) certainly contributes to the students' perception that English is a tool one must master only in order to study and pass exams. It is not personally meaningful at all. English is predominantly the language of academic contexts. One could argue that reading in English could help the students increase their chances of performing well on their exams. Unfortunately, the exams consist of fill in the blanks questions, and some multiple choice and short answer questions. They certainly do not require too much critical thinking. Rote memorization is quite sufficient. While I agree that it is challenging to encourage students to use English outside of school where they seem perfectly happy communicating in their mother tongue or Kiswahili, it is imperative that the use of English in school change from purely formal and transactional to more expressive, interactive, and socially meaningful. One of the main barriers that has traditionally made this shift impossible is that teaching in Kenya is very teacher-centred. In addition, instruction in an English classroom is often limited to cloze tests, reading comprehension exercises, and short answer questions. Students are generally not given opportunities to express their opinions or engage in class discussions or debates. Chalk and talk dominates classroom interactions. But, how do we encourage teachers in Kenya to adopt a more student-centred approach? How can we support them in this shift to a more participatory environment? I think that the small, gradual steps - the approach we used this past summer - are necessary to help teachers move out of their current comfort zone and test themselves using a different teaching methodology. According to Commeyras and Inyega (2007), two research-based Kenyan documents (MOEST, 2001; Willis, 1988) suggest that teachers can promote greater interest in reading by reading aloud to their students. Furthermore, talking with students about the texts as preparation for independent reading can also be very effective (Willis, 1988). Of course, the challenge here is that this approach requires that the teachers themselves be committed and enthusiastic readers willing to share their personal stories and reactions with their students. I believe that the students need to see in their teachers a high level of authentic engagement with a text in order to be encouraged by this approach. Teachers need to learn how to communicate their passion for reading and they need support in learning how to initiate and sustain meaningful conversations about texts in their classrooms. This is not an easy task for a teacher who is used to lecturing and who every day walks into a classroom where the students have been conditioned to sit quietly and listen. 2. Helping the teacher convey that value to students who have spent years in a teacher-centred system that rewards those who are quiet and equate learning with rote memorization. The teachers who attended the TWB-Canada workshops in Kenya were very open to new ideas and most were very enthusiastic about creating a more student-centred environment in their classrooms. I look forward to meeting many of them again next summer and I plan to continue to work on encouraging independent reading and an open, participatory classroom culture. MOEST (2001) provides a variety of ways for encouraging students to read, including setting aside time each week to be used for reading in class; specifying the amount of reading to be done out of class and keeping a record to track the reading that the pupil has done; asking students to give oral reports of what they are reading; using resource persons to read to the pupils, modeling how they want the pupils to read; and rewarding effort made to read (Commeyras & Inyega, 2007). The one barrier that still needs to be addressed, however, is the question of access. When we discuss independent reading in North America, or in any developed nation, we don't spend too much time thinking about access to appropriate materials. We take for granted that students have access to libraries, either in their schools or in the community. We know that their parents can also purchase books or magazines. Access to reading material is not an issue. In Kenya, things are very different. Efforts to encourage independent reading will be pointless if the students have no access to reading materials. While some schools we visited in rural Kenya had small libraries or book collections, most did not have any reading material except textbooks. Consequently, another goal for our next project in Kenya is to help improve access to reading materials by fundraising for paperbacks or magazine subscriptions that can be purchased locally to eliminate shipping costs. In short, as I begin to prepare for next year's Teachers Without Borders workshops in Kenya, I think about how we can best assist Kenyan teachers in creating an environment in their classrooms where the students will be given opportunities to share their views, participate in debates, and use English in an expressive, creative way, not merely as a tool to help them fill in the blanks on a test. The teachers I met in Kenya were very open to making the kind of shift in their pedagogy that is required to ensure that their students have opportunities to move away from the formal and transactional uses of English and towards a more expressive and personal voice. At the same time, I realize that access to paperbacks and magazines will be crucial and I hope that, as a team, Teachers Without Borders - Canada will be able to raise enough funds to bring more books to Kenyan classrooms. If you think you might be able to help, please let me know. Commeyras, M. & Inyega, H. (2007). 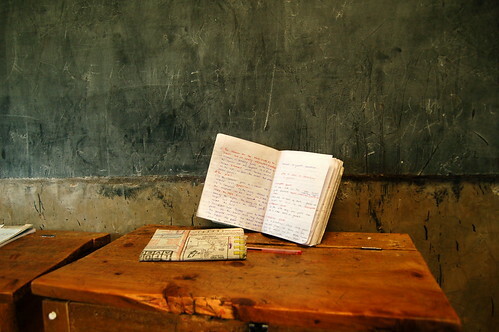 An integrative review of teaching reading in Kenyan primary schools. Reading Research Quarterly, 42(2), 258-281. Ministry of Education Science and Technology. (2001). Teaching and learning English in the primary classroom: English module. Nairobi: Jomo Kenyatta Foundation. Muthwii, M. (2004). Language of instruction: A qualitative analysis of the perception of parents, pupils, and teachers among the Kalenjin in Kenya. Language, Culture, and Curriculum, 17, 15-32. Willis, B.J. (1988). Aspects of the acquisition of orality and literacy in Kenyan primary school children (Kiswahili). Dissertation Abstracts International, 50, 433. (UMI No. 8908590).